Hemsworth and Barnsley shared the use of a poorhouse at Ackworth. It was built in 1736 at the north side of what is now the Barnsley Road. The location of the building is shown on the 1854 map below. The West Riding proved troublesome for the Poor Law Commissioners who were attempting to create a standard system of Poor Law Unions across the whole of England and Wales. A legacy of Gilbert Unions and independent townships which fell outside the provisions of the 1834 Poor Law Amendment Act, coupled with a general economic depression in the 1840s, resulted in continued resistance to the plans for unionisation. The old Ackworth workhouse continued in use but was eventually condemned after an inspector found it to be in "a disgusting condition". West Riding of Yorkshire: Ackworth (2), Badsworth, Brierley, North Elmsall, South Elmsall, West Hardwick, Havercroft, Hemsworth (2), Hessle, South Hiendley, Hill Top, Great Houghton, Little Houghton, Little Smeaton, Kirk Smeaton, Ryhill, Shafton, South Kirkby, Skelbrooke, Thorpe Audlin, Upton, Walden Stubbs, Wintersett. The population falling within the Union at the 1841 census had been 8,129 with parishes and townships ranging in size from Hill Top (population 92) to Ackworth (1,828). The average annual poor-rate expenditure for the period 1848-50 had been £1,971 or 4s.10d. per head of the population. 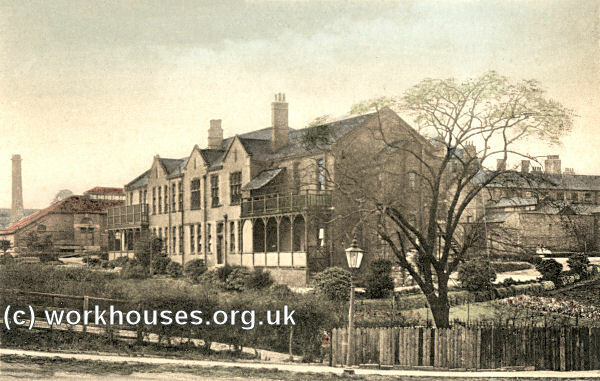 Hemsworth workhouse from the south-east, c.1910. 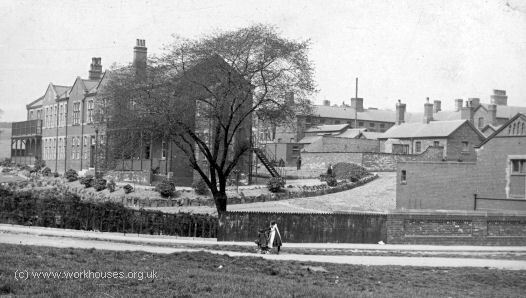 Hemsworth workhouse from the south-east, date unknown. I inspected this workhouse on the 14th of January 1867. It is built to accommodate 95 inmates, and usually there are in it from 30 to 40 inmates, of whom 20 probably will be old and infirm, five or six able-bodied, and 10 or 12 children. The site of the house is good, and the accommodation for the several classes of inmates, with the exception of that for fever and infectious cases, is fair. There are detached fever or infectious wards, but, in their present condition, they are unfit for use. The wards are very small, and it would be very dangerous to place a nurse in either ward with a fever or infectious case. There are no separate sick wards for the children. The ventilation and water supply are good, but the arrangements for light are defective, the windows being too high up in the walls of several wards. Most of the beds are in an unsatisfactory state, for they are exceedingly hard; some of the bedsteads are in an imperfect condition; utensils are insufficient, and the conveniences for washing are inadequate. The classification, diet, and clothing are sufficient; the inmates are either too old or too young for employment; and there are not sufficient means of recreation for the sick, and infirm and aged. The medical officer finds all drugs. There is no paid nurse. All the inmates are permitted to go out to church or chapel. There is a school in the workhouse, the teaching is entrusted to a discharged marine, nearly 82 years old, who is an inmate of the house. The house requires painting inside; nearly all the jambs of the doors are loose; the walls of the house want pointing; the exercising yards were coveted with snow when I inspected the workhouse, so that I cannot report on their condition. The master and matron are the only paid officers in the house. 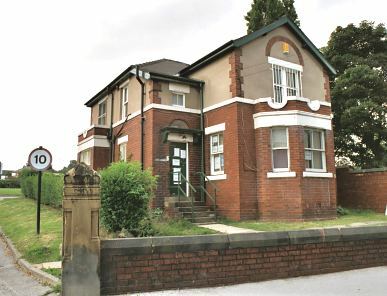 In 1930, the workhouse became a Public Assistance Institution within the West Riding's Osgoldcross Guardians' Area. The Institution chiefly provided accommodation for the elderly and the vagrants' wards closed in 1934. Electricity was installed throughout the site in 1935 — prior to then lighting had been by gas with the exception of the porter's lodge, board-room and Master's house. A plan of the site in 1930 is shown below. Hemsworth workhouse site plan, 1930. The former workhouse site subsequently became Southmoor Hospital. Only the Master's house and 1903 infirmary now (2001) survive from the workhouse era. Hemsworth infirmary from the north-east, 2001. Hemsworth workhouse Master's house from the east, 2001. I revisited this site in the early 1980s (my first such visit in fifty years!) and found the administrative part at the front of the block was still in use and occupied by either Social Services or NHS. I was able to gain access to the original inmate accommodation and found the small dormitories in virtually an unchanged state with badly flaking painted walls (top half cream, lower half brown with thin green line separating them — this was the standard décor as you will be aware). The Master and Matron`s house was being used at the time as sleeping accommodation for doctors on call. I was allowed access and could recall my own bedroom, the kitchen and sitting room (I had not seen them since I left at the age of four!). The picture of the house is from 1932 or 1933 — the figure shown is my aunt. I was born in the room directly over the bay window. 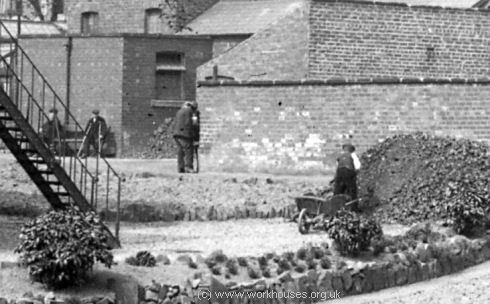 Hemsworth workhouse Master's house from the west, c.1932. 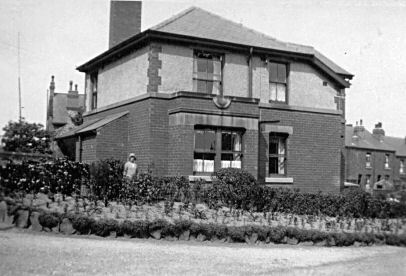 The Hemsworth Union operated a children's home at Barnsley Road, Hemsworth. In 1924, the home could accommodate 31 children, with Miss A. Turton as its Superintendent. West Yorkshire Archive Service — Wakefield, Registry of Deeds, Newstead Road, Wakefield, WF1 2DE. Holdings comprise: Guardians' minute books (1860-1929); Correspondence (1872-1930); Relief records (1871-1948); Financial records (1850-1931); Relieving officers' accounts (1918-1948); clerk's account book (1849-1855); etc.